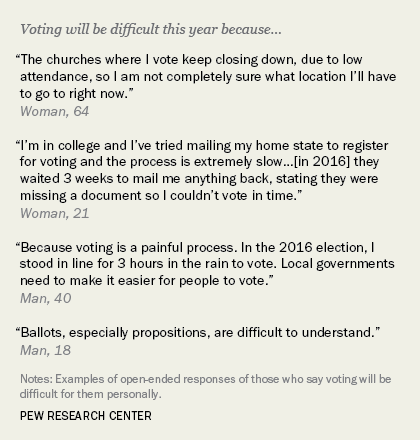 When people are asked about their overall impressions of voting, there is a broad consensus that voting is “important.” But smaller majorities say it is “convenient,” “straightforward” or “exciting,” according to a new Pew Research Center survey on elections in America. Young adults, in particular, are less likely than older people to say voting is convenient and exciting: 50% of adults younger than 30 say voting is convenient, while 49% say it is exciting. That compares with majorities in older age groups. The survey also asks people about whether voting this year will be easy or difficult. A large majority (84%) of those who plan to vote in the midterms say voting will be easy, though fewer than half (44%) say they expect it will be very easy. 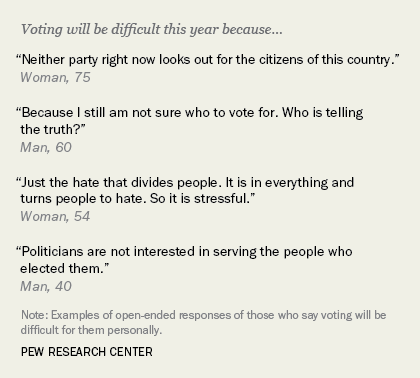 About one-in-seven people (15%) who plan to vote say it will be difficult. There are age and racial differences in views of whether voting will be difficult. About one-in-five adults under 30 who plan to vote (22%) say it will be difficult, compared with 13% of those 50 and older. Among those who plan to vote, blacks are more than twice as likely as whites to say it will be difficult (29% vs. 13%). Those who plan to vote and say voting will be difficult were asked an open-ended question about why they think this will be the case. This group cites a variety of reasons for why they expect voting to be difficult; the most frequent center on the general political environment (23%) and logistical concerns (22%). About a quarter (23%) offer a response related to the political environment, including 10% who cite concerns regarding candidate choices and 10% who mention the divisive political environment. Concerns about logistical hurdles are mentioned by more than a fifth of these voters (22%). 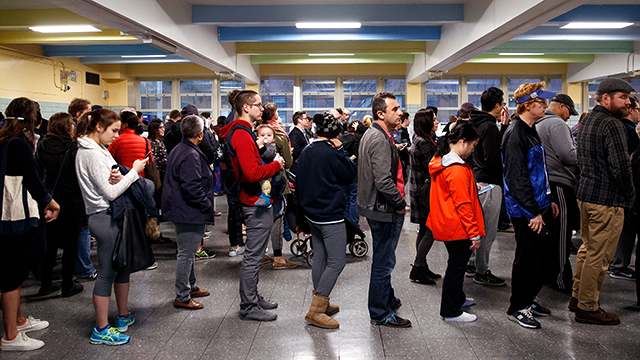 These include long wait times and large crowds at the polls (6%), not having enough time to research the candidates and ballot propositions in each race (6%), personal scheduling conflicts (4%), lack of polling places or difficulty in accessing voting stations (3%) and uncertainty about how to vote in general (3%). The security of the vote count is cited as a concern by 9% of those who plan to vote but say it will be difficult – 6% are concerned about the accuracy of vote tabulation by polling officials or corruption in the counting of ballots, and 3% are worried about foreign interference in the process by Russia or other outside actors. About the same number of voters for whom it will be difficult (8%) say that participating in elections doesn’t matter all that much. Among these voters, 4% express a lack of trust in the candidates, or say their views were not effectively represented by either party’s viewpoints. Another 4% say that their vote would not change things much either way. Note: The methodology and topline can be found here.